A great way to use up every last morsel of the Christmas dinner. Preheat the oven to 180°C/gas mark 4. Grease a 12-cup muffin tin. Unroll the pastry on a lightly floured surface. Stamp discs out of the pastry with a 6cm to 8cm pastry cutter. Place a pastry disc in each cup of the muffin tin, gently pressing it in to fit the bottom and go up the sides. Line each muffin case with a small square of parchment paper and full with ceramic baking beans or dried beans. Bake in the oven for 10 to 12 minutes, until golden brown. Remove from the oven and leave to cool for a few minutes while you get the filling ready. Increase the oven temperature to 220°C/gas mark 7. Heat the oil in a sauté pan set over a medium heat. Add the turkey, ham, carrots, onion and garlic, season with salt and pepper and sauté for 4 to 5 minutes, until the onions have softened. Stir in the flour and cook for 1 minute more to coat the vegetables. Pour in the stock and bring to a simmer. Cook for 3 to 4 minutes, until the sauce coats the back of a spoon. Remove from the heat and check the seasoning. 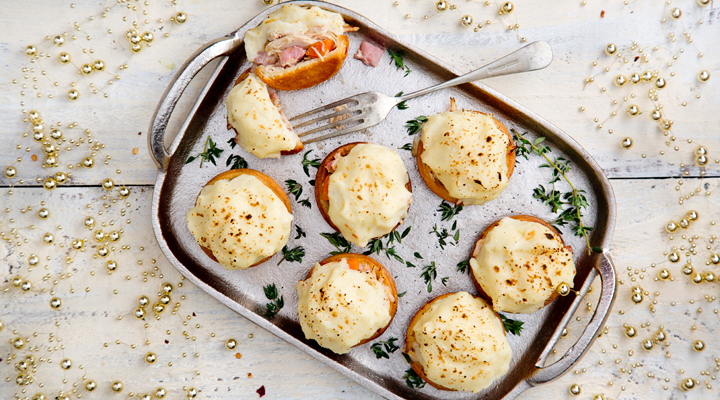 Fill the baked pastry cups with the turkey and ham filling and top each one with some leftover mashed potatoes. Bake in the oven for 10 to 15 minutes, until the mashed potatoes and filling are piping hot and the top is golden brown. Tip: These mini pies freeze well.